While the FBI argued the stays were necessary because of the bureau’s immense FOIA backlog, it’s not clear that the Open America stays would coincide with a concerted effort to clear the backlog. 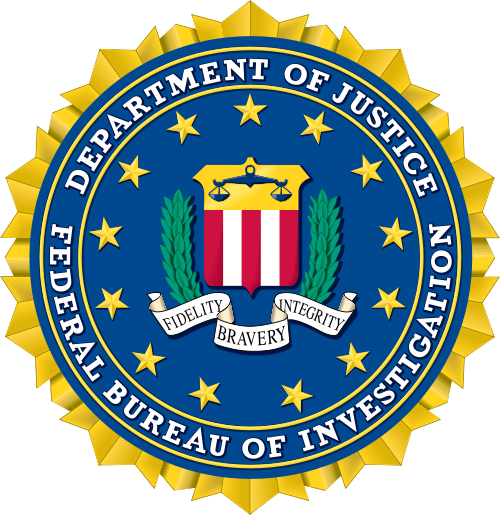 Congress should use the FBI’s suspect position as an opportunity to investigate the extent to which the practice of staying FOIA lawsuits is employed at the Department of Justice and possibly other agencies, and what methods agencies are (or aren’t) taking to address their FOIA backlogs. A FOIA request submitted by Public Citizen has won the release of Adam Smith’s financial disclosure form. Smith is the Federal Trade Commission’s new Bureau of Consumer Protection director, and the form raises serious questions about an array of perceived conflicts of interest. The form lists more than four dozen clients Smith worked with during his time at the corporate law firm Covington & Burling, among them were Uber, Equifax, and payday lender Scott Tucker, which was fined $1.3 billion by the FTC. Smith has also represented most of the nation’s large financial firms, including those fined for securities and consumer protection violations. The Government Accountability Office has released a new report on FOIA implementation in response to a 2016 request from Congress to determine agencies’ compliance with the law. GAO selected the 18 agencies surveyed in the report based on size and other factors and assessed their performance against 6 metrics mandated by the FOIA. These metrics include online access to government information, including information about FOIA liaisons in agency communications with requesters, and training FOIA personnel. GAO recommends, in short, that agencies follow all of the FOIA’s requirements. A new report from OpenTheGovernment focuses on FOIA trends at the NSA, DIA, Army, Navy, CIA, and ODNI as compared to the rest of the federal government. 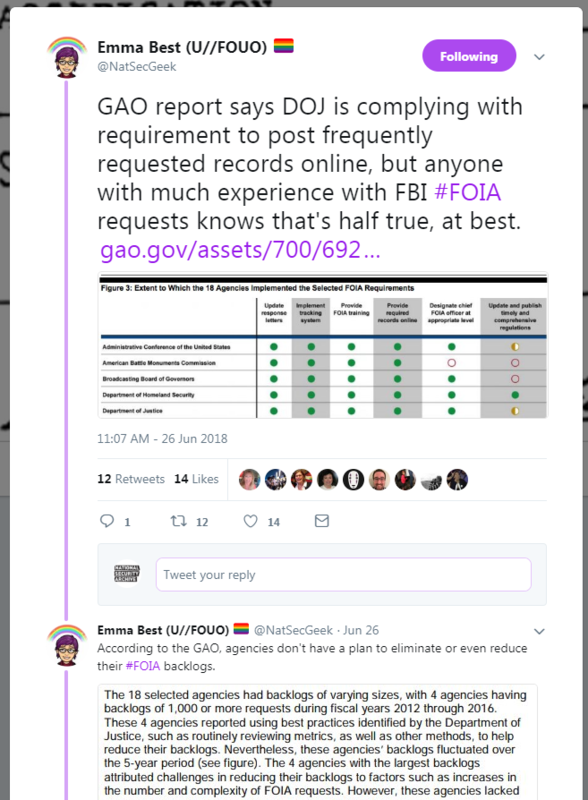 OTG found that processing times for complex FOIA requests at these agencies are nearly three times longer than the government-wide average, and that the NSA and DIA’s processing times are worst of all at nearly 6 times the government-wide average. The NSA and CIA fully denied about 40-percent of all FOIA requests on exemption grounds last year. The OTG data begs a number of important questions, key among them being what is the rationale behind the CIA’s litigation-based denials, and what do the litigations costs reported in the agency’s annual FOIA reports actually cover? Addition of USCYBERCOM as a combatant command and the creation of the cyber mission force. Command and control for cyberspace operations are given deeper attention. Information is reflected as a joint function. Cyber operation planning is given deeper attention including intelligence and operational analysis support as well as targeting. 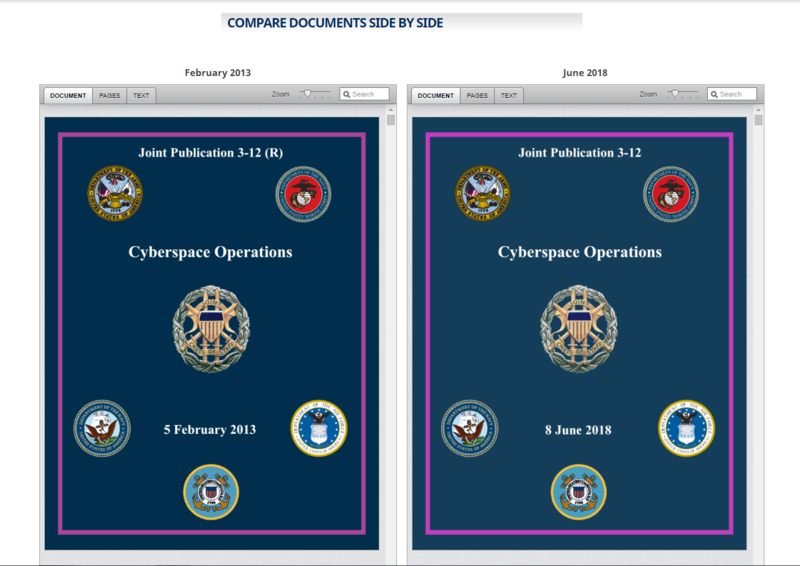 The Cyber Vault has a side-by-side view of both versions of the document to help readers compare versions and spot changes. This week’s #TBT pick comes from our China Documentation Project and is a 2011 posting celebrating the publication of over 2,000 documents on the U.S. intelligence community’s efforts spying on China. The documents include a U.S. defense intelligence document from 2001 that details Chinese plans for developing radiofrequency weapons (although it stops short of speculating on their possible purpose). Other records reflect on contemporary issues, like the risks of constructing nuclear power plants – like the Fukushima facility that exploded after the recent tsunami – at questionable sites in Japan.